If you have a potential interest in adopting one of these horses please fill out the attached Adoption Application form and return to us by mail or email. ​For more information on our horses please contact Heading for Home. “Rock” is a 12-year-old retired standardbred racehorse who was a regular at Saratoga Harness track for 8+ years, where had the majority of his 29 lifetime wins and earnings of almost $290k. Anyone who followed the racing at Saratoga through those years knew of Rock and marveled at his consistency. So, after all of his hard work and the memories he gave to his owners, they were all too happy to enter him into the Heading for Home retraining and adoption program, and have continued to support Rock and our organization with financial support through our “Stand By Our Standardbreds” program. They will continue to do so until Rock finds his new special home. So, if a hard-working loveable horse is in your future plans, might that home be yours? Please consider Rock! “Crazylegs” is a 12-year-old retired standardbred racehorse who has won races at Saratoga Harness and other NYS racetracks, including 12 career wins and earnings of over $100k. He also even had the opportunity to participate in a “race under saddle” in his final year of racing and placed 4th. He was officially retired from racing in 2013 and has been getting extensive training and attention while in the Heading for Home’s retraining and adoption program. His owners placed him in the program so that he could find a caring new home where he would enjoy a second career and maybe be spoiled like we spoil him! If you are looking for a great horse, consider this excellent choice. Danny is a retired thoroughbred racehorse who has won races in Saratoga and other NYS racetracks. He was officially retired from racing in early 2016. ​We wish you well at your new home!! For various reasons we unfortunately cannot always immediately take horses into our retraining program, but we want to help if we can by posting information about other former racehorses we know of that are looking for homes. Below are pictures and information about these horses that have been forwarded to us by their current owners in hopes that someone may be interested in contacting them to learn more about the horses. Please check them out and if you are interested in learning more send us a message through our contact link and we can put you in touch. Thank you. Here’s a picture of Cookie. His race name is Dragons Fate. This picture is 8 or 9 years old. 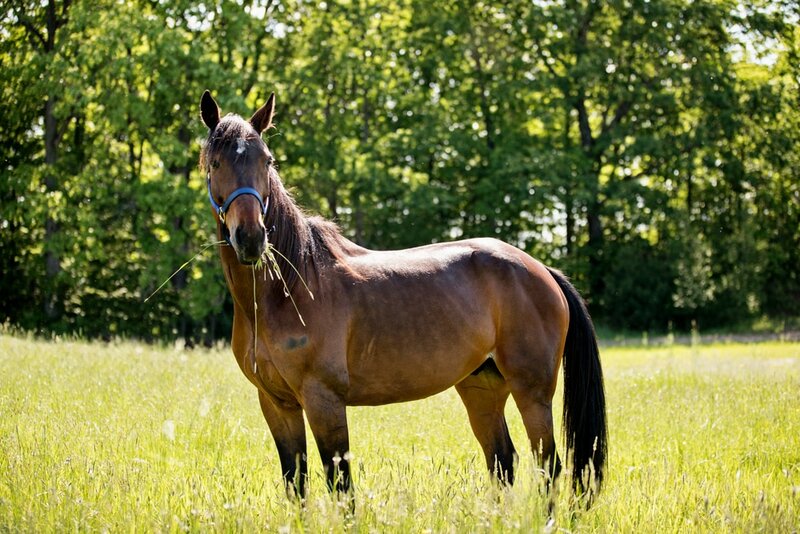 ​Cookie is a 23 year old pacing gelding. He has been ridden but only around paddocks and fields. No formal training. He has not been ridden in years though. He can be driven of course. He has a sweet personality. He will be the boss of the paddock but is not mean about it at all. He's been turned out with all different horses and never had a problem with any of them. Cookie is currently on 24/7 turn out with a big stall to get out of the weather if need be. He is only brought in when it was really bad. He is also fine with being stabled and turned out. He has been barefoot since he retired from racing and he retired sound. No leg injuries at all. Thank you for your help. ​Wateree is a 16 year old retired thoroughbred mare that was owned and raced in Saratoga. Since retirement. members of the original ownership group have provided her a home but feel she still has more to give to someone interested in working with her under saddle. She previously had some restarting saddle training after racing and would work best given a steady routine. Waterlee is a beauty and easy on the ground, been turned out with others, and is considered mid pack in the pecking order of the herd. She has been well cared for her whole life so owners are looking for someone to continue that as she still has a lot to give. If interested contact us about Wateree and we will put you in touch.